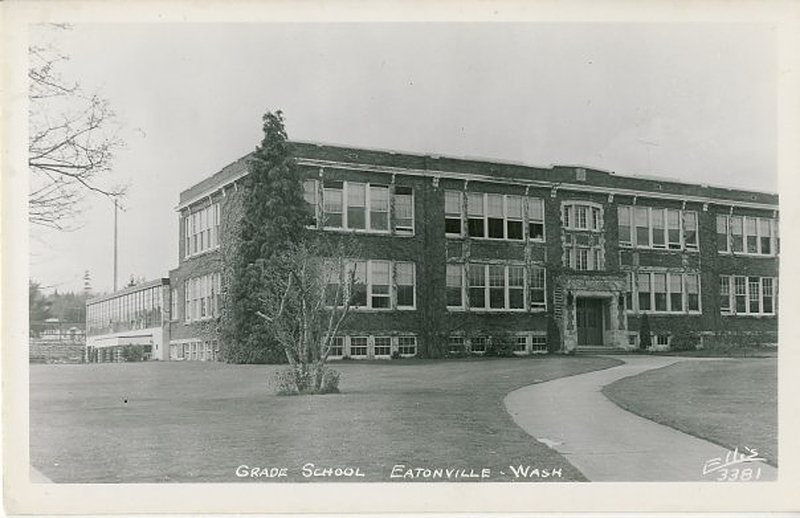 Eatonville is no stranger to earthquakes. One that left lasting memories shook the place up on April 13, 1949. At 11:52 am the town started rocking and rolling. Many recall the cement streets rolling like waves. Margit Thorvaldson says she was in the grocery store at the time and it took her a moment to realize what was happening. She remembers a woman more “earthquake savvy” than herself move to a doorway as items fell from the shelves. 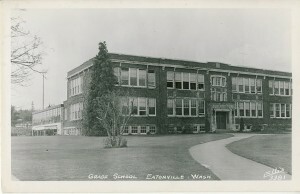 Although over a dozen chimneys fell, the Hotes building (100 S. Mashell) had damage and the wood reservoir feeding the Eatonville Lumber company engine had to be replaced. It was the high school, however, that got the worst of it. The auditorium and cafeteria were out of the commission for the rest of the year and engineers from Tacoma came and attached steel rods and shored things up. It could have been much worse. The Dispatch reported that the entire student body has been scheduled to be in the auditorium from 11 to 12. Luckily, the assembly had been let out a little early that day — minutes before the quake hit. Roy Swanson, an eighth grader at the time, remembers he and Kenny Hamilton walking downtown and seeing all the smashed bottles at the liquor store. The manager later gave out corks to many of the regular customers. • a 3.6 tremor in 1979. • a damaging 6.8 quake that lasted 40 seconds in February, 2001. Despite the fact that the quake happened 30 miles under ground, it still caused cracks in the gymnasium wall and tennis court. It was also reported that the water tower of Dow Ridge moved 4 inches off its cement resting pad. This time around though, the liquor store only lost two bottles. I remember the 1st earthquake I ever experienced when I was about 10 or 11, I think. that would have been like 1963, or ’64. I don’t know how big it was, and notice you don’t have it on your list of quake dates. I just remember we still lived at Clearlake and the house started shaking. My mom got my sister, brother and I into the bathroom, since it was the smallest room and in the center of the house. Seems like it lasted 5 minutes, but it probably didn’t really last that long. I do remember for some time after that, everytime a big truck would rumble down the road, I would think it was another earthquake. The only other quake I have been in was the “spring break quake’ in Molalla,Or. in 1993. we were living in Oregon City, only a few miles from the epi-center. Our 3 daughters were home,Our 2 sons were at their friends house. This quake was VERY powerful,6.0 and it was a very shallow one. I just remember the girls screeming, and all the nik-naks on the shelves falling and crashing on the floor. The girls thought I was shaking their beds to wake them up since it happened at 5:30 A.M. I will see if there is any news on the 1960s quake. Maybe it didn’t get much coverage because there wasn’t much damage. Diane, the earth quake David Beane is talking about happened in 1965. I was a senior in high school at the time and had skipped school that day to complete a term paper for Vinor Fish. Around noon, the quake hit hard then there was allot of shaking. I can remember Dad’s Jim Beam bottle collection raddeling around on the window sills and mom’s best dishes vibrating hard enough to open the cabinet door they were stored in. Having the wrong priorities, I quickly saved dad’s Jim Beam bottle collection first then ran to save mom’s dishes . As I remember, we had very little damage that day and I did finish Mr. Fish’s term paper. If they were FULL Jim Beam bottles, then your priorities were right !!! That is one thing your dad, and my dad had in common, Jim Beam !! If it was in’65, guess I was 12 or 13 when that happened. I don’t know why we would have been home if it was a school day, maybe it was after we got home from school. Maybe it was felt stronger in Clearlake area, than in Eatonville. Would love some info on Vinor Fish. Maybe you knew his son, Harold? School yearbook pix? We are all descended from the same Puritan in Massachusetts. I will try to find some. Thanks! I believe he was my mom’s teacher and extremely well respected!